Since 2007, the SENNEBOGEN Maxcab has been setting standards in the world of materials handling with its sliding door and air-sprung comfort seat. As the most-installed cab of all SENNEBOGEN cab models, the Maxcab has been given a new interior. 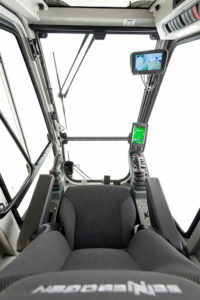 The entire driver area has been optimized to meet the latest requirements in ergonomics. A new comfort seat and perfectly arranged joysticks and controls make work more relaxed, facilitating concentration and minimizing any symptoms of fatigue. A new climate-control comfort seat provides custom support for every driver thanks to continuous, fully automatic weight setting up to 150 kg. 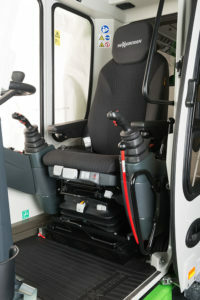 The seat can be adjusted to any position desired thanks to a wide range of setting options. For example, the inclination of the arm rests can be changed and the height and inclination of the headrest are also variable. The seat and backrest can also be inclined flexibly and a pneumatic lumbar support relieves strain on the back. A pleasant seat-heating function comes as standard to provide maximum driver comfort. What’s more, optional seat climate-control system can effectively heat and cool the seat at three levels. This extensive climate-control package made up of the climate-controlled seat and the cab climate-control system that comes as standard guarantees comfortable working under any weather conditions and creates the perfect climate in the cab. In addition to the driver seat, the layout and shape of the controls and the joysticks were also revised. By positioning the brackets directly on the seat, they are resonantly mounted and easy to reach. The revised, ergonomic shape of the SENNEBOGEN joysticks facilitates the delicate actuation of all functions and is easier on the wrists. In addition to the joysticks, the other controls are now also even easier to reach and the driver now also always has an ideal view of the SENCON control and diagnostic system. The tried-and-tested sliding door and the sturdy platform with railing provide maximum safety and comfort even when getting into the cab. The door opening is particularly large, which makes getting in and out of the Maxcab easier. 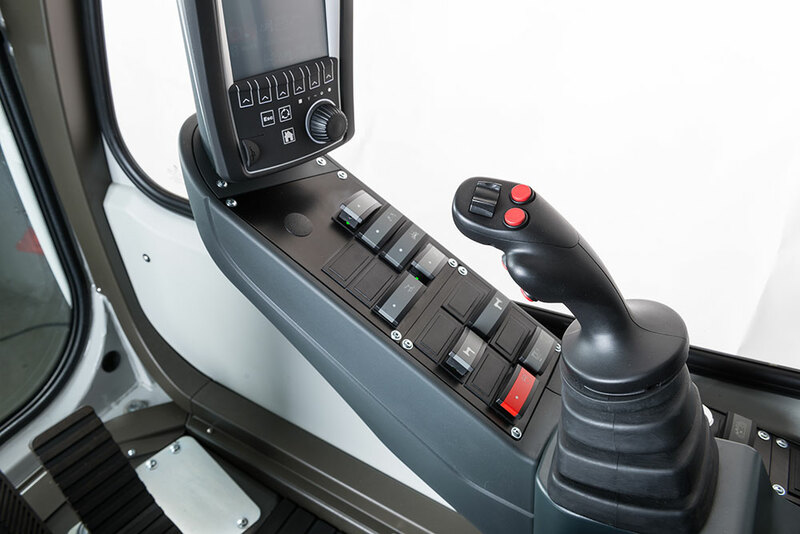 Overall, the new driver area of the Maxcab cab can now be customized to make it more individual and ergonomic for each user. The high quality of the components used promises a high service life and maximum comfort even under permanent load.